Is Ground Beef Good for Your Diet? 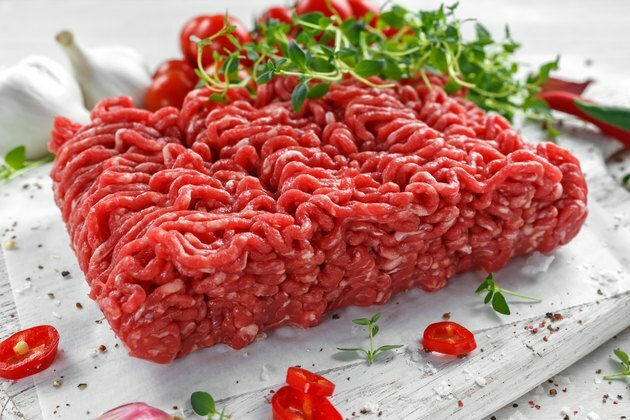 Ground beef is a type of meat product that just about everyone is familiar with: It's what you use to make meatballs, burgers, chili and various other types of foods. It's easy enough to find this meat at any supermarket or butcher's shop. Whether or not it's healthy for you comes down to its fat-to-protein ratio. Fortunately, the best part about ground beef is that you can create your own to best suit your diet. Ground beef is an excellent source of protein, B vitamins and iron. For good health, choose 95 percent lean versions of ground beef to limit your fat and saturated fat intake. Ground Beef: Good or Bad? Ground beef often gets a bad reputation compared to other cuts of beef. Many people associate ground beef of any type with leftover meat products, which means that you could get a range of desirable or undesirable cuts in this product. The worst part about ground beef for most people is its fat content. Whether or not you want your meat to be fatty is based on your preferences and diet. However, you should consume animal fats in moderation. Foods made from red meats, like ground beef, contain saturated fat, which can raise your cholesterol and be bad for your heart if you eat too much of it. According to the American Heart Association, you should limit your saturated fat consumption to about 13 grams per day. Ground beef can vary substantially in fat and protein content. The majority of ground beef is always protein (lean meat). Its fat content can also range from as little as 5 percent to as much as 30 percent. This enormous difference is part of the reason ground beef has such a bad reputation. It can be hard to know what you're getting when you buy this product. Since the content of ground beef can vary, you need to look at the fat-to-protein ratio to understand what you're getting. Fat brings out flavor, but if you're a big fan of meat or are following a high-protein diet, you should consume fatty meat in moderation due to its high saturated fat content. Ground beef is also a good source of B vitamins and most minerals, including iron, phosphorus, potassium, selenium and zinc. The amounts of these nutrients vary depending on the content of protein and fat in your ground beef. There are more nutrients in some types of ground beef that contain higher protein and less fat content. Lean ground beef, with 95 percent protein and 5 percent fat, contains the most nutrients and the least saturated fat. From a nutritional perspective, this is definitely the best type of ground beef available. However, because it has so little fat, this type of ground beef is easy to overcook and isn't as flavorful as other varieties. This means that despite its health benefits, only 1 percent of sales can be attributed to this type of healthy ground beef. A total of just 18 percent of sales consist of ground beef made of 90 to 95 percent protein and 5 to 10 percent fat. Unfortunately, fattier types of ground beef are more popular with consumers, which is clearly part of the reason people think ground beef is bad for you. When you buy premade ground beef, you may be consuming multiple animals. This practice means that cross-contamination can occur more easily, increasing the likelihood of food-borne illness caused by bacteria like Salmonella, Listeria and Shewanella. Fortunately, many disease-causing bacteria can be combated by thoroughly cooking ground beef until it's well-done and choosing meats produced from animals that are raised in healthy environments. Natural antimicrobial strategies, using certain edible essential oils from herbs and spices, such as thyme oil, may also be useful in combating these bacteria. A 2015 study in the Journal of Food Processing and Preservation showed that these oils can even add other beneficial properties, like antioxidants, to your ground beef. If you have access to a meat grinder or a butcher who's willing to prepare ground beef for you, creating your own ground beef can be fantastic. Ground beef tastes different based on the cuts it's prepared with. Grinding your own beef allows you to add the specific cuts of meat or amounts of fat that you prefer in order to influence both nutrition and flavor. Red meat and other animal products are known for containing saturated fat, which is well-known for being bad for your health. However, according to a 2016 study in the Korean Journal for Food Science of Animal Resources, highly marbled fat is not the same as other animal fats. In fact, highly marbled beef, like Wagyu beef or Hanwoo beef, have high amounts of monounsaturated fatty acids like oleic acid. High-fat beef coming from sources like these can be good for your cardiovascular health, unlike some other meats, as they are rich in heart-healthy fats. A 2015 study in the Journal of Meat Science also showed that ground beef made from brisket is also better for you than many types of beef. Like Wagyu and Hanwoo, brisket has large amounts of heart-healthy fats and less saturated fat. What Is the Difference Between Ground Chuck & 80% Lean Ground Beef?